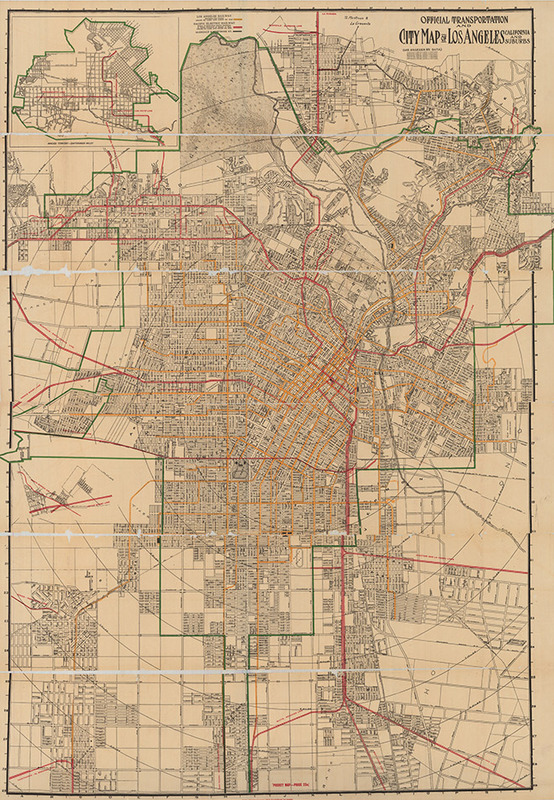 This map carries two distinctive stories: one about a magnificent streetcar system and the other about one of Los Angeles’ great feminist heroes and map copyright trailblazer. The map itself is the kind of precise beauty expected of Laura L. Whitlock, who was “the official mapmaker of Los Angeles County” during the teens and “the only woman map publisher in the country” at that point. Laura was born in Iowa but migrated west with her mother, stopping in Nebraska (she did a stint as a music teacher) before moving on to L.A. in 1895. She again taught music at 6th and Hill, but by 1901 with her teaching gigs lagging, she took a job at a florist who shared quarters with a tourist information bureau—perhaps the impetus for her interest in cartography. By 1907 she was the president of the Pacific Coast Travel club and took to making and selling maps that she researched meticulously and drew with an artistic flair. During this time she studied all manner of railroad and engineering maps and put together six plates of an official map of the city while working out of her office in the Los Angeles Times building. Unfortunately, all of these originals were destroyed when the Times building was bombed on October 1, 1910, leaving her with the daunting task of rebuilding the map with base materials she had kept in a safe deposit box. In the meantime, unscrupulous publishers pirated her printed map and sold thousands of copies without regard to copyright. The demure (looking) Laura, who had risen to the top in a male-dominated industry within a patriarchal society, put her nose to the legal grindstone and, through rigorous study, became the legal expert on map copyright. She took her case through three levels of courts while being opposed by big-money publishers, but the work paid off (literally): Whitlock scored an eventual victory and a substantial dollar settlement at the end of a rip-snorting eight-day trial. With her newfound cash she set up shop in the Exchange Building where she created this fine map as well as one of the Pacific Electric Interurban Railway System that recalls all of the stations along the routes. 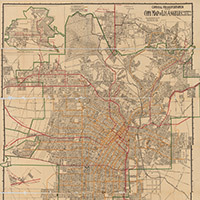 The maps were announced in late January 1911 and published the next month with great success. The map seen here is very large and detailed, especially in the rail lines (which were Whitlock’s passion). We can see the yellow lines of the LARY (Los Angeles Railway), the red lines of the PE (Pacific Electric) and the black of Glendale and Montrose railway. There is an excellent rendering of the Los Angeles River with many other landmarks present: Exposition Park before the Coliseum, Watts when it was agricultural, the early iterations of Hollywood, the Silver Lake reservoir, and Eagle Rock Valley, along with assorted neighborhoods (Pico Heights, Annandale, Boyle Heights, Arlington Heights). In the upper left is the San Fernando Valley, which became suddenly vital upon its new nourishment by the water of the Los Angeles Aqueduct. 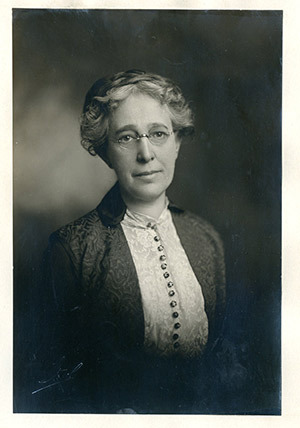 Laura L. Whitlock continued to publish maps of the city and county into the 1920’s and finally died of old age in 1934. She is buried at Inglewood Park Cemetery alongside other Los Angeles notables: Tom Bradley, Kenneth Hahn, Frank Shaw, Fletcher Bowron, Tom Owen, and my grandparents.